Augmented reality on the iPhone is taking off at an incredible rate, but none of the apps we have seen before have been as impressive as Bionic Eye. 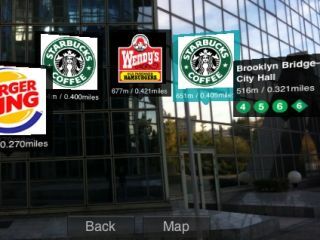 Created by Presselite, the app makes use of the iPhone's camera to bring alive the area you are in like never before. The new app offers up a whole host of visual reference points (10,000 if you live in the US) like your nearest fast-food chain and underground access, all with 360-degree functionality. Fully compatible with Google Maps, the app will throw up a Points of Interest in your location and is updated in real-time, so the closer you get to a POI the distance logger will change. Not only that, if you point your iPhone to the ground, then a handy blue arrow will appear pointing the way to your desired destination, so you can sit back take a sip on your iPint and let the app do all the navigational work for you. The Bionic Eye app is available now from the Apple App store and works in the UK, the US, France and Tokyo.